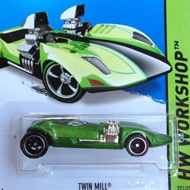 243/250 is part of the HW Workshop series and the 2014 Super Treasure Hunt set. The race car boasts purple Spectraflame paint with red & silver graphics on the sides, a silver graphic on the hood bulge, and a Summit logo on the roof. 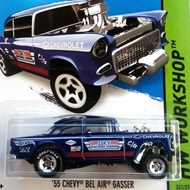 The sides also have “Summit Racing Equipment”, “TH”, and the Hot Wheels logo. It has light blue windows, a chrome interior, Real Rider 5-spoke mag-style wheels with red rims and black spokes, and a grey plastic Malaysia base. The Chevy is a modified Chevelle with a roll cage and rear spoiler. It made its debut in the 2013 HW Showroom series.